Everyone is welcome to join in this casual gathering. Catch up with old friends and make some new ones. It’s a great way to start off the week. We’ll announce PTG award recipients for 2018 and start the convention with a preview of the outstanding lineup of classes and special activities scheduled for this year. You’ll have an opportunity to win some nice prizes and join in the fun as we launch our 2018 convention. PTG President Paul Brown invites you to join him in a fun-filled evening of food, entertainment and socializing. 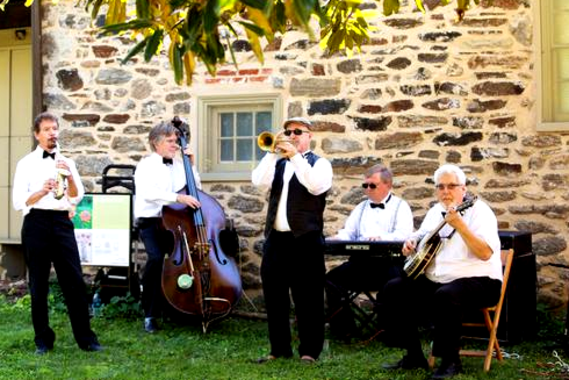 Whatever flavor of jazz you like, Ben Mauger’s Vintage Jazz Band (http://www.benmaugersvintagejazzband.com) will have the place hopping with their energy, enthusiasm and sense of nostalgia. Dressed for the occasion, this top notch jazz band hails from Central Pennsylvania. Veterans of jazz festivals, street fairs, community events, clubs and many private events, you’ll see why audiences love them. Everyone is welcome! Get a first look at many of your favorite suppliers, manufacturers and vendors in the PTG Convention Exhibit Hall. Entry a drawing, consult with a company rep and start shopping. Venture out onto the “Roads Less Traveled” through the heart of the Amish Farmlands. You’ll see pristine Amish farms, one-room schoolhouses, windwheels, Amish “phone booths” and farmers working the fields with their horse or mule-drawn plows. Includes a stop at an Amish Quilt & Craft Shop followed by an authentic Amish meal at a real Amish home. Spend the afternoon in nearby historic Lititz for sightseeing and shopping with stops at the Sturgis Pretzel Bakery and Wilbur Chocolate Store to see demonstrations and sample their wares. Transportation, lunch and all activities included for $88 per person. Space is limited, so reserve your spot by June 1. Jack Naglick is 14 years old and began playing the piano at age five. He has won numerous competitions including first place winner of the coveted Steinway Society 2017 Junior Artist Competition and the first place winner in the State of Michigan Stillman Kelley Competition. Jack was also honored to win the first place award in the prestigious Metropolitan Detroit Musicians League Young Artist Competition in 2016. Jack also plays the oboe, and is a member of the Oakland Youth Orchestra. In his free time, Jack values sharing his music throughout the community. He also enjoys composing music, reading, birdwatching, and playing table tennis. Jack is very passionate about playing the piano and oboe, and he hopes to have a career as a professional musician. When visiting Longwood Gardens, you are immersed not only in the breathtaking surrounds, but in the rich history as well. Years before it was a public garden, the land on which Longwood Gardens stands was home to the native Lenni Lenape tribe and Quaker farmers. Since then, the land has undergone significant transformation to become the magnificent property that is enjoyed by more than a million guests each year. Tours of the Garden are self-guided, so you can go at your own pace and choose the areas that especially interest you. Visit Longwood’s unique organ museum for an astonishing behind-the-scenes look at the grand collection of pipes. Ranging from a one inch in size to an amazing 32 feet tall, the pipes are housed in special climate-controlled chambers with viewing windows for visitors. A state of the art exhibit outlines the history of organs around the world and the story of The Longwood Organ, which began when du Pont built the ballroom in 1929. Longwood just completed a multi-million dollar restoration of the main water fountain. Watch the YouTube Flowing Water Documentary Trailer. Shop at the Gardens Shop and enjoy lunch on your own at The Café or the 1908 Fine Dining Room. Transportation and Garden entrance ticket are included for $60 per person. Space is limited, so reserve your spot by June 1. Come share your voice and harmonize with the Larry Crabb Barbershop Chorus. Now directed by Bill Davis, RPT, this volunteer group has filled the room and charmed PTG convention audiences for over 35 years. You can be a part of this co-ed group. Just sign up when you check in at the PTG Registration Desk. Follow up the Barbershop Concert with another opportunity to enjoy time with friends in an informal setting. Enjoy the complimentary dessert bar and music. Take a swing around the dance floor if you dare! Cash bar available. Join us as we celebrate this year’s Golden Hammer Award recipient. After a full course dinner, celebrate this year’s convention and get a sneak peek at our 2019 event. Banquet tickets are included with full registrations. Additional tickets $45 each. PTG volunteers will be leading a 60-minute non-denominational service of music and inspiration. Observation technique is a must when we evaluate pianos before purchase. The ability to spot any flaws and questionable areas of old pianos will save a tuner’s reputation. Hosted by one of the most entertaining presenters in the field, you’ll have a great time competing against others to see how well you really know your pianos. You’ll see a picture showing just a piano part, or design feature, etc. and then try to name the piano just by seeing the clue shown in the picture. Participants (and observers) will learn from each other as we share different opinions on what we see in the picture. There are prizes for winners (like books, tools, piano parts and souvenirs.) If you want to play, bring something to contribute to the prize table.